This platform consists of a plastic drawer which can retract under the desk surface. There is a separate pad for holding the mouse. 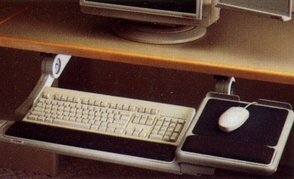 The platforms both have built in gel wrist rests and can be height adjusted. It is attached to the underside of a desk / workstation top by fitting the brackets, and the keyboard platform clamps onto this bracket. Detailed fitting instructions are included with the item. Model 3M Adjustable Keyboard Tray: One basic Model Only.